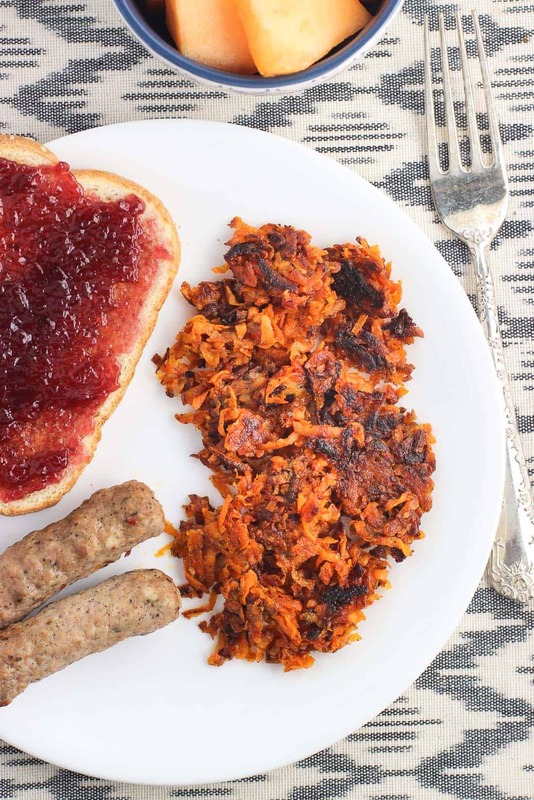 These Spiced Sweet Potato Hash Browns are a new spin on a breakfast favorite! These hash browns feature a warm spice blend and can be made two ways – either traditionally on the stovetop or baked for a lighter option! For a long (long, long) time I was ‘ehhh’ on breakfast. I always made sure to eat breakfast because it’s the right thing to do (!) but I never got that jazzed about it. Toast or an English muffin, usually slathered with peanut butter and/or jelly was sitting on my kitchen table each and every day. Granted this was before I learned the love that is avocado toast, so my toast days back then erred on the side of being of a traditional (and boring) breakfast carb. After the toast phase I went through a serious infatuation with vanilla Greek yogurt, mixed with bran cereal and chopped frozen strawberries. For about two years I froze my fingers chopping hard frozen strawberries every morning. Until one day, mid-chopping, I realized I had completely lost my appetite for my beloved yogurt/bran cereal/strawberry bowl. It’s going on three or four years since and I still have no desire to eat it! Hello, breakfast burnout. Currently I’m head over heels for all things savory in the A.M. Smashed avocado with smoked paprika and sea salt on a toasted sesame bagel thin (♥), eggs, even leftover dinner if my avo stash is gone. 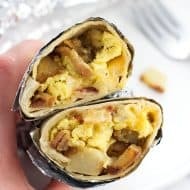 But one of my favorite, favorite special occasion breakfasts lately have to be breakfast burritos. Probably the epitome of savory breakfast goodness! 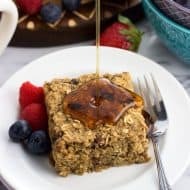 I love adding hash browns to my breakfast burritos, and with the heavy emphasis on healthy eating this time of year, I wanted to switch up my hash brown varieties. 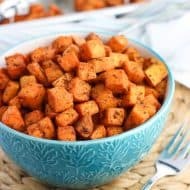 These are sweet potato hash browns that feature a mix of spices and can be made both the traditional way on the stovetop OR baked for a healthier option! Let’s dig into the traditional way first – crisped perfection made in a skillet with clarified butter (aka ghee). 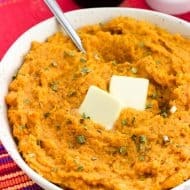 Ghee is used here because it has a very high smoke point, so it allows the sweet potato shreds to turn a deep brown without burning and smelling a little off. Plus I love the subtle nutty flavor that ghee gives, kind of brown butter-esque. I’ve only purchased ghee from the store, but there are plenty of tutorials out there for making your own at home. It’s on my list for 2016! 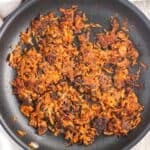 Now onto the lightened-up (but still delicious) version – baked spiced sweet potato hash browns! As with a lot of baked versions of typically-fried foods, baked hash browns aren’t an exact dupe of the stovetop version, but we really enjoyed them. I used a few in a recipe coming up next week to the blog, and then refrigerated the rest. Heating them up in an oven on 350 degrees F on a small greased baking sheet until they were warm and crisped up again? Awesome. A little sprinkle of sea salt over top and they were back to breakfast perfection. 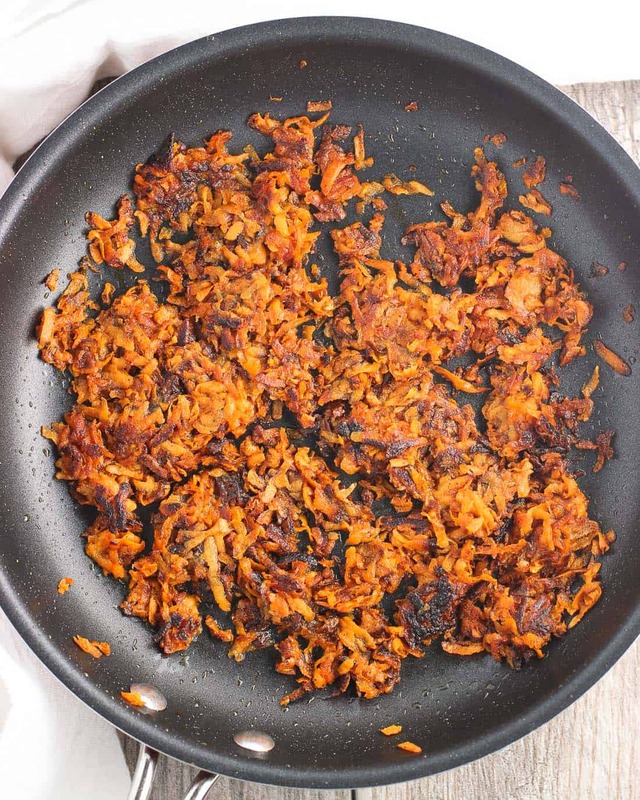 Real talk: I kept my *baked* sweet potato hash browns in the oven for a few minutes too long, about 30 minutes, and the outermost shreds were a liiiiittle crispy for my liking. If this happens to you, just remove the burnt offenders and you’re still in business (which is what I did before I took these photos). Dry the shreds at much as possible. I added the shreds to a salad spinner and spun out as much water as I could. Then I placed the shreds between two layers of paper towels and squeezed out as much excess moisture as I could. Add shreds to a bowl and sprinkle over top the salt, onion powder, black pepper, paprika, ancho chile pepper, turmeric, and dried coriander. Toss to evenly combine. Heat ghee in a large non-stick skillet over medium heat. Once the ghee has melted, add sweet potato shreds in an even layer. Allow the sweet potato shreds to cook undisturbed until the bottom is crisp and has reached a nice deep brown. Once the bottom has browned, break up the layer into smaller pieces and flip them over so the top sides are now on the bottom. Continue to cook for several minutes longer, or until all sides have browned. Keep flipping the hash browns to prevent burning. If the skillet becomes too dry, add a little extra ghee if needed. Once hash browns are crisp, remove onto a paper-towel lined plate to cool slightly and continue to crisp. Preheat oven to 425 degrees F. Generously grease a baking sheet with butter. 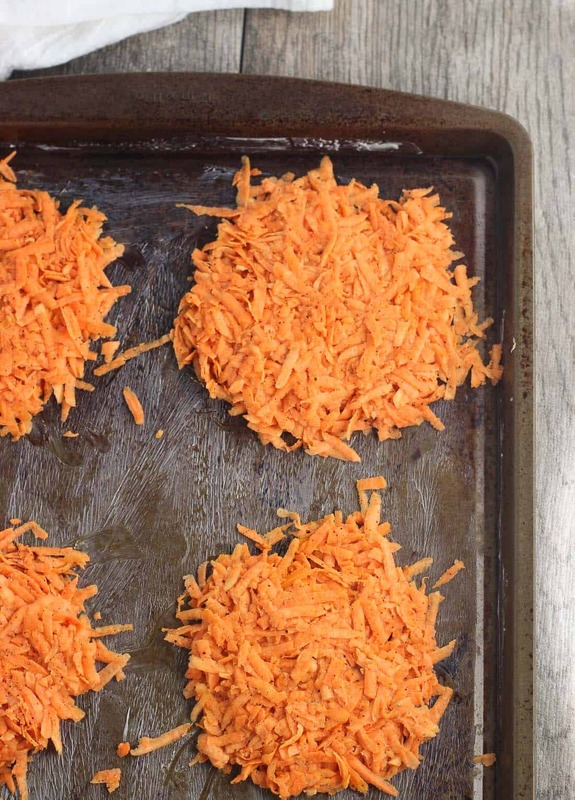 Form rough "patties" with the potato shreds and place them evenly spaced on the baking sheet. Cook for about 15 minutes, and then remove. 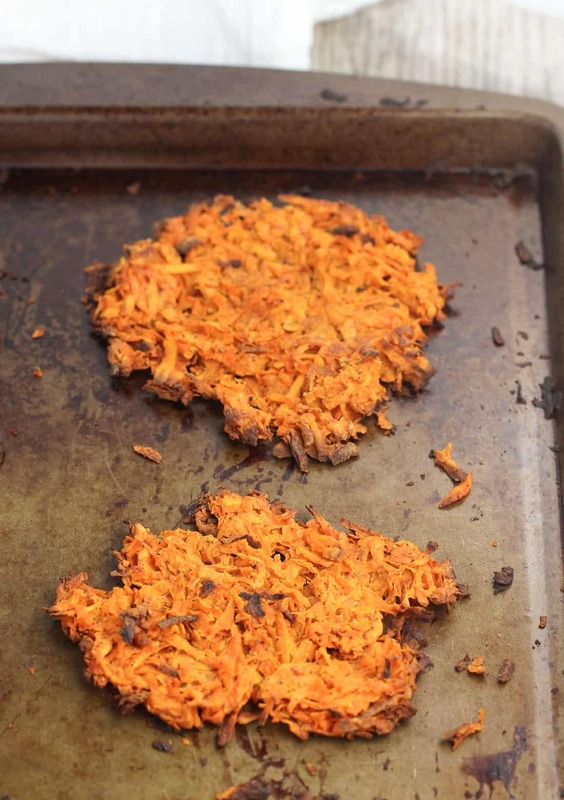 Reduce oven temperature to 350 degrees F.
Flip sweet potato patties over and press down on each to flatten them slightly. Some pieces may come apart, but just form them back into patties again. Place back in the oven and bake for an additional 20-25 minutes or so, or until the hash browns have browned nicely around the edges. Let cool on the baking sheet. I enjoy the spice mixture listed above for a not-too-strongly spiced version of hash browns, but feel free to use your favorite spices! Refrigerate extras. To reheat, I suggest heating the oven to 350 degrees F and placing hash browns on a baking sheet. Reheat until they're warm and have begun to crisp again. Sprinkle with sea salt and serve! 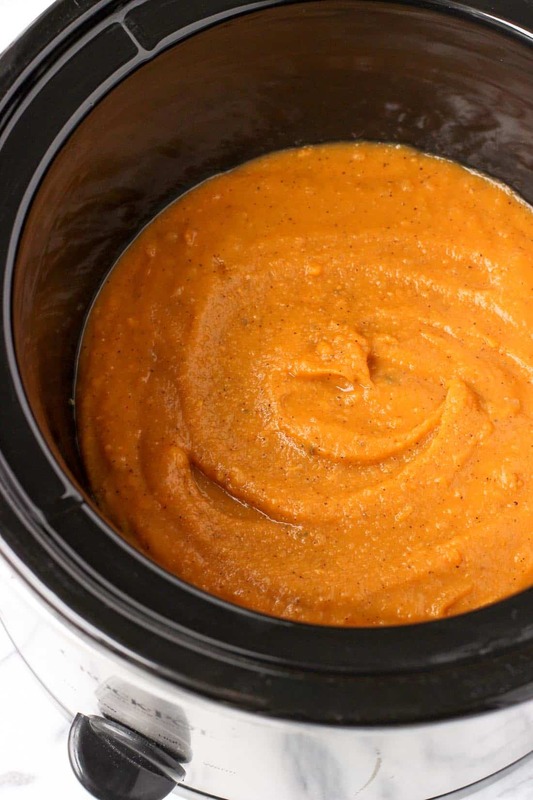 If you’re looking for more sweet potato recipes, check these out! I am on team savory breakfast, too! 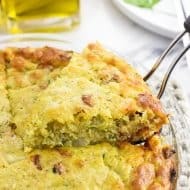 I love love love the looks of these hashbrowns, and the idea of putting them in a breakfast burrito! Oh man!! I am loving the spices you used in this! 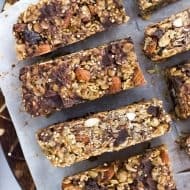 We are major major sweet potato lovers around here, I have got to make these! Isn’t it funny how tastes change over the years? I definitely lean more towards savory dishes now, too. These hash browns look SO good, Alyssa! 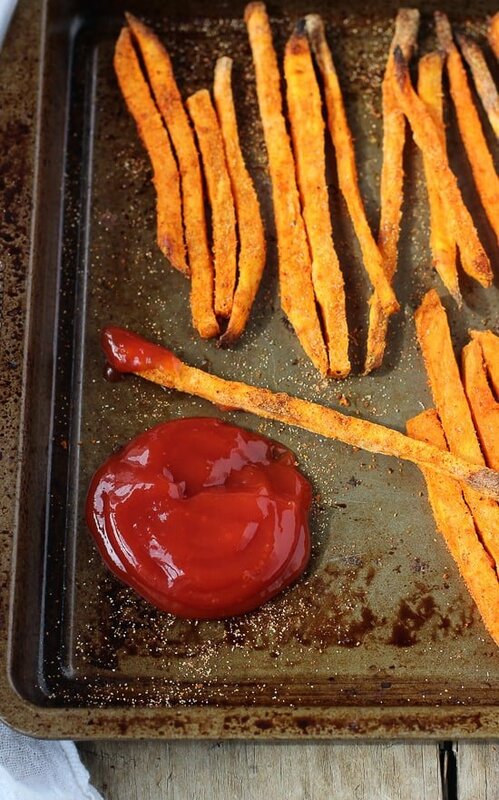 I love that you used sweet potatoes instead of the regular kind. What a perfect way to start out the day!